Congratulations to the Class of 2018! Our students have earned more than $1 million in merit scholarships and their academic achievements and investment in their passions have earned them acceptances from some of the most prestigious universities around the world. Bold, bright and intrepid, our graduating Class of 2018 is full of individuals who independently shine and whose collective energy is a force to be reckoned with. Their innate generosity and creativity complements the holistic Mulgrave education they have received. Congratulations to the Class of 2017! Our students have earned over $1,250,000 in merit scholarships and their academic achievements and investment in their passions have earned them acceptances from some of the most prestigious universities around the world. Please click below to access a PDF version of the document. Congratulations to the Class of 2016! Our students have earned over three quarters of a million dollars in merit scholarships and have been accepted to some of the most prestigious universities around the world. Congratulations to the Class of 2015! Our students have earned over half a million dollars in merit scholarships and have been accepted to some prestigious universities around the world. Please click the below to access a PDF version of the document. Congratulations to the Class of 2014! Our students have earned over $1,000,000 in scholarships and have been accepted to some of the most prestigious universities around the world. Please click below to access a PDF version of the comprehensive list of university acceptances. Congratulations to the Class of 2013! 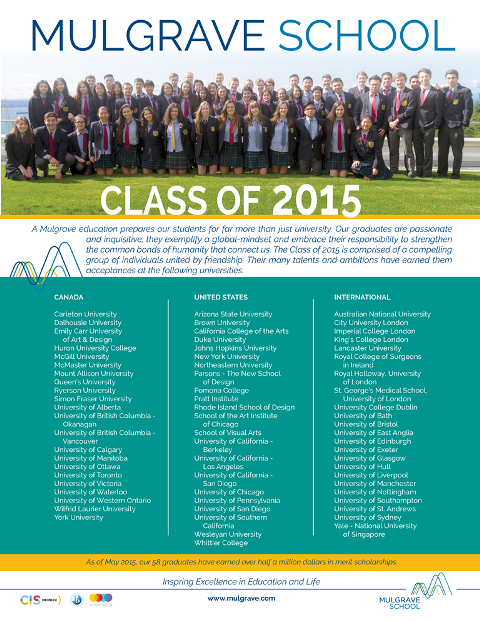 Mulgrave graduates will be attending the following schools and were awarded, thus far, over $450,000 in scholarships. Mulgrave graduates from the Class of 2012 are attending the following schools and were awarded over $300,000 in scholarships. Mulgrave graduates from the class of 2011 are attending the following schools and were awarded over $358,000 in scholarships. Mulgrave graduates from the class of 2010 attended the following schools and were awarded over $330,000 in scholarships. Mulgrave graduates from the class of 2009 attended the following schools and were awarded over $760,000 in scholarships.